I spent 6 months living in Portland and became addicted to this Bahn Mi shop. It has a drive-thru! Their BBQ pork bahn was my favorite. Try their avocado shake also- it’s addictive! Oh I miss this place! A great shop in beaverton, many different varities ( greater than 30 ). Try “Baguette”, the tiny little shop at 501 SW 2nd Street. If you blink, you’ll miss it. And if you want to eat the sandwiches then and there, you’ll probably want to take them down the riverfront a ways and find a spot to sit down. There are only two tables in the tiny place, and they are somewhat inconvenient. But the food is the BEST! We love it and are thrilled to have found an authentic Banh! Great crusty bread, great grilled meats! The best in the area. Fat Straw in the NW or Hawthorne areas focus on bubble teas, but carry multiple Banh Mi’s including a vegetarian version with faux turkey. Very tasty! Pho Hoa in Issaquah also serves Banh Mi. Decent Pho too! Cafe Pho in downtown Seattle. The BEST tofu banh mi can be had at Yeh Yeh’s in Lynnwood, WA, just off Route 99. Off NE 82nd, on the back side of Pho Oregon. The bread is perfect, that’s all – just absolutely perfect. All the usual fillings, in just the right proportiions. Cheap – NOT inexpensive, downright cheap. Aaaannnnd, you can snag a fabulous French pastry or Vietnamese dessert to finish. There are two shop that I’ve found bang mi: “pho Kim” in south Everett (just north of 128th, in the walmart parking lot), also in north Everett at “pho on Broadway” (half block south of ampm). Hope that helps. Fatstrawpdx.com has the best I’ve ever had! And not to mention the service and girls are incredible. Just sit back chill on the computers and eat my favorite sammie! Our family loves the Bunh Mi at “The Soy House” in Bellingham, WA. Their bread has the perfect balance of crust and the filling is loaded with goodies and flavor. It’s so hard to get anything else when we go there; although everything is excellent. We’ve never had anything that wasn’t. The Monkey Bridge, Ballard district Seattle. Banh Mi and a cup of chicken rice soup is the best lunch deal around! If you live in Seattle…..DO NOT SLEEP ON THIS ADVICE!!!! Buy the baguettes, ask for pickled daikon and the rest is up to you!!! less than 10 bucks you can make A BUNCH OF BAHN MI BANGERS!!! Huongs food cart on 10th and Alder in downtown Portland has the best and most economical sandwich I have found in the area. Sw 4th street, near the PSU campus. I’m on a never ending quest to find the best banh mi, and this is easily the best I have found in the city. And at $3.50 or two for $6, the price is definitely right. Surprised no one had mentioned this cart already. Tan Tan Cafe & Delicatessen at 316 SE 123rd Avenue (right off Mill Plain) in Vancouver, WA, has amazing Banh Mi (get the #11!) and aromatic pho. Very friendly staff, too. The banh mi rolls are the perfect blend of crusty softness. Gotta love the avocado shake and the Iced Coffee too! Baguette in Corvallis, OR, has since moved to 121 SW Third Street. I agree with Jo. Tan Tan Cafe on Mill Plain in Vancouver, WA is the bomb. Great Banh Mi and the Pho is very good too. The staff is very friendly and helpful. Try one of the pork pastries as well. Yummy Pho in Bella Bottega in Redmond, WA. Fantastic tofu banh mi at The Old Gold 2105 N. Killingsworth, Portland, OR Great flavor and texture (and it’s vegan!) 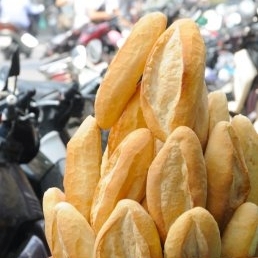 They get their bread from Binh Minh Bakery. I agree with Riley, the Banh Mi cart on SW 4th near PSU is awesome. Also, Tan Tan Cafe & Deli in Beaverton is really good, and you can get other stuff there too. We like to make our own Banh Mi at home, so I keep telling my boyfriend that he can buy the carrot & daikon already prepared at Tan Tan, but he has yet to take advantage of it. $2.50 for the tofu version. Yeh Yeh’s in Bellevue is great. Love it and inexpensive. They also have a place in Lynwood. No other banh mi shop comes even close with I banh mi in downtown Portland. Cool name, great banh mi on top of their mouth watering cookies and pastries. Top vote for me, check them out. You will not regret it! AWESOME just awesome. Kind of tucked away but worth it once you find it. Another vote for Yeh Yeh’s in Lynnwood. Beats the bejeebus out of any other banh mi I’ve had in the Puget Sound area. I agree with Emee about An Xuyen Bakery in Portland. Better by far than any of the food carts, and they have a great variety too. Good pastries and baked goods as well. Banh Mi in the U-District is great! Both the Lemongrass fish Banh Mi and the Eggplant Banh Mi are amazing! Bon Mi in Eugene, Oregon. Wonderful. Sub Sand is my absolute favorite in Seattle. It might look a little sketchy, but this place is great! I’ve been to most places in the city, and Billiard Hoang is my favorite. The bbq pork is particularly good, as are their bahn mi with fried egg, but they are all solid. Lucky’s Pho is a block north of the Fremont Bridge in Seattle’s Fremont neighborhood. It has fantastic bahn mi sandwiches. They are by far the best bang-for-your-buck lunch in the area. My favorite is the spicy chicken. Log in | 81 queries. 0.461 seconds.